You know those amazing spiritual journals you see all over pinterest and instagram, the ones with bible verses written in beautiful typography with little flowers and hearts detailing the side, everything is hand drawn by this ridiculously photogenic girl who sips her Starbucks and has every art supply known to man? Well I'm not one of those girls. I can't draw, I definitely cannot do typography and my instagram pictures could do with a lot of work. But I wanted a spiritual journal and I wanted it to look as good as the skinny jean clad Christian hipster girl's in the corner of the coffee shop with her bible open and all her crayons. And so I bought myself a nice new notebook and I got myself some felt tips and coloured pens and glitter and I set to work on drawing a heart with a bible verse in the middle. For about an hour I scribbled and rubbed and pencilled and ripped out a page until finally irritated to the max I gave up. Why couldn't I draw a nice heart around my bible verse? Why couldn't I have cute drawings and amazing typography and bright colours and fabulous hipster hair? The problem was I was going about it all wrong, instead of thinking how will a spiritual journal help me in my faith and what was my individual way of doing it using my own gifts I tried to copy some one else's. It wasn't until a few months later that I decided to try again but this time no pictures, no colours, no drawings, just words. I am a writer as many of you know and words are my fortay, creative writing is my fortay, fancy calligraphy and pictures of suns beaming down on bible verses are not my fortay. And so I wrote as I like to write. 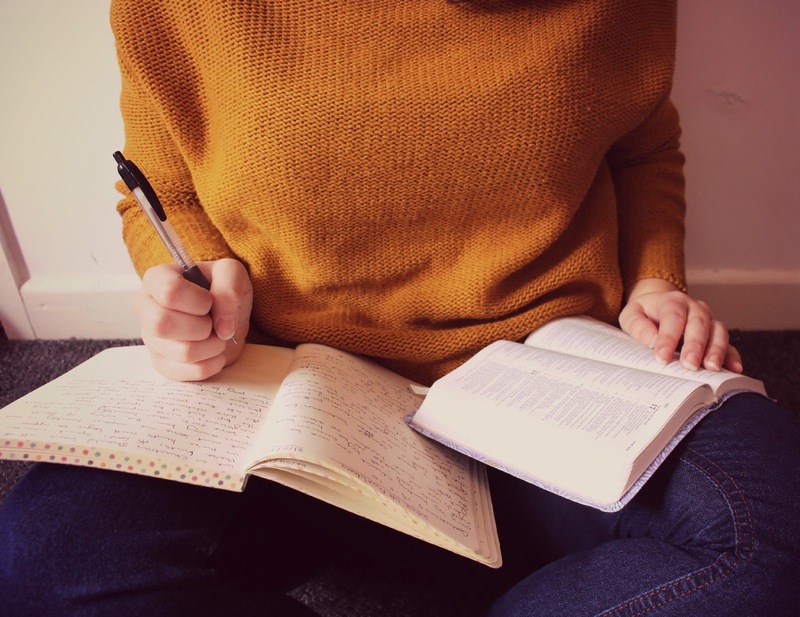 I wrote prayers, messages I felt God was telling to me, pieces of creative writing, a letter to God, bible verses and what I felt they meant to me at that time and much more. My spiritual journal has now become somewhere I can share the innermost thoughts and feelings of my relationship with God in a way that works for me. For some people it may be drawing pictures for me it was writing. What I want you to encourage you in today is to be yourself. God has blessed us all with multiple gifts some can draw, some can sing, some can write, some can play music, others sports, others are amazing speakers the list is endless. But just because you can't get up and lead worship or do an amazing talk in front of thousands of women doesn't make your gifts any less. In this world we are often guilty of imagining some gifts are greater than others but God loves all our gifts, he created them as he created us each unique and individual in our own way. Anybody who has played with children knows what an amazing gift it is when a child brings you a drawing that they drew for you and for God its the same. He delights in our gifts and loves it when we bring them back to him. Whatever you're good at see if you can bring it back to God, use it to praise him and come closer to him. Even if you feel like your gift isn't one you can use to praise God I challenge you to find a way that you can bring it back to him, I am 100% sure there is a way you can. Just remember that God delights in you in Psalm 37: 23 it says that God "delights in every detail of their lives" (NLT) he delights in every detail of your life in all your passions and all your gifts and he loves you to use them for him and for his glory. So whatever your gifts are use them to praise God, use them to get closer to him and enjoy what our amazing Father has given us.